The foremost challenge in energy crisis management is to meet the ever-rising demand for the seamless supply of energy to the technology-driven twenty-first century. The rising depletion of fossil fuels and environmental pollution impose an immediate need for green energy. This stimulated the fabrication of energy storage devices necessary for hybrid electric vehicles, portable electronics, and power grid systems. Supercapacitor is an important energy storage device for electric vehicle and portable electronics. However, architecting the electrode materials with suitable geometry is one of the major hurdles toward the development of energy storage devices with high-energy densities. 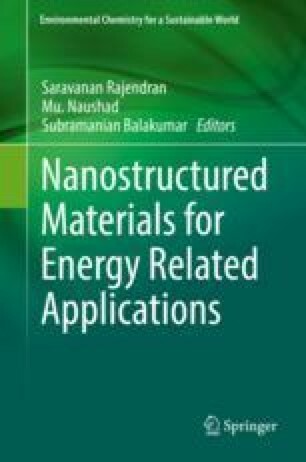 In view of this, the current chapter focuses on the fabrication of binder-free emerging vertical nanostructures for the application as active supercapacitor electrodes. This chapter emphasizes the importance of vertical nano-architectures and critical points toward the rational design of supercapacitor electrodes. A broad overview on the recent developments of vertical nano-architectures for supercapacitor electrode applications and the future directions in achieving efficient supercapacitor devices are highlighted. Subrata Ghosh acknowledges financial support from Basic Science Research Program (2017R1D1A1B03028311) of the National Research Foundation of Korea. We are thankful to the anonymous reviewers for valuable suggestion and researchers for their significant contribution in the energy storage research.